Call Today for a Free Quote on Tent Rental! Are you holding a party and need the proper equipment rental services? For the finest in tent rental and other party rentals, choose the experts at Taylor Rental. We provide the finest in party equipment to the Ocala, FL area! We guarantee that we will have your exact equipment rental specifically where and when you need it, without any issues. Give us a call today for more information our equipment rental services! After all, when you're planning an event, the last thing you want to have to worry about is if the party rentals are actually going to show up. You can always rely on Taylor Rental. That's why people keep coming back to us for everything from tent rental to small and large scale equipment rental. They know that they won't have to worry about promptness! Give us a call today and we'll tailor a rental package to your individual needs. We empower you to make the best decisions regarding your equipment rental. You'll never have to deal with hidden charges, hassles, or worse, malfunctioning equipment. With Taylor, it's quality every step of the way, from our customer service to our rentals themselves. Talk to Our Experts About Your Desired Party Rentals! Large-scale parties often require a lot of different materials and equipment. Planning out the specifics for all the party rentals can be overwhelming! When it's time to plan your next party or event, call Taylor Rentals about party rentals today! We have a wide inventory of party rental items from cookware to entertainment equipment. We assure you that everything we have in stock comes at a fantastic price! Browse our selection for your next large get-together, and you won't have to worry about your event not running smoothly! Our party supplies include a variety of tent rentals priced to keep you and your guests out of the sun for less than the competition. Our tent rentals come in a variety of sizes depending on your need. We will work with you to give you the party rentals you need. 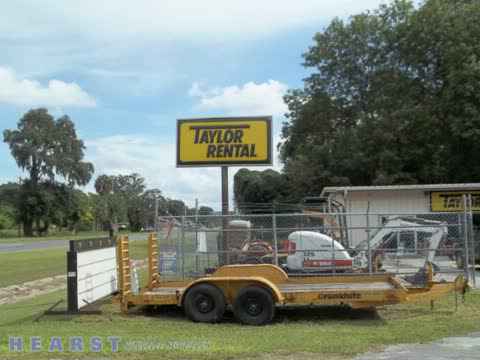 Taylor Rental is the premier equipment rental service in Ocala, FL. Our Party Rentals Offer More Than Just Tent Rental! When it comes to party rentals, the options are endless. We provide everything from fine utensils, tables and chairs to all the extras that you can't find anywhere else, like bounce houses, coffeemakers and even raffle drums. We can even bring the dance floor! Make your event one to remember for less: call Taylor for all your equipment needs. We have always been committed to keeping your mind off your equipment. You can have confidence that your equipment is well maintained, always fueled, and that you and your employees are well trained. There are two store locations to meet your needs as fast as possible across the Western New York area. Providing our customers with exceptional service is our number one priority. We accomplish this by keeping our equipment for party rentals in excellent shape to ensure that they will be working properly for your event. The quality and safety of our equipment rental will exceed your expectations. With every party rental and tent rental we serve, we continue to prove that our goal is to be the best. Our equipment and tool rental services are included with our party rentals, depending on the rental you have ordered. These tools include, but are not limited to, generators and compressors, man and aerial lifts, and more! All of our equipment rental items are thoroughly inspected upon return of said item. This is to make sure they are not damaged, but also ensures the safety of the person renting said item after you. We want to make sure that our customers are not only getting the very best equipment, but are also satisfied with our party rentals and services. We offer a wide range of industrial equipment for rent at affordable prices. If you are a commercial or industrial contractor and need equipment, we have you covered. We serve clients in Ocala FL and the surrounding areas. Every equipment rental from us is reasonably priced. Our products include forklifts, generators, and more. You can trust that your rental equipment will be ready to work for you. After all, we’re one of the area’s equipment rental leaders! Whether you need tent rental for a graduation party or party rentals for a large corporate picnic, choose Taylor Rental! Our services are tailored to your needs and we are proud to provide some of the best services to the Ocala, FL area! Give us a call today for all your equipment and tent rental needs at 352-629-7936 or visit us at 3930 S Pine Ave Ocala, FL 34480 (Mon-Fri 7:00am-5:00pm and Sat 7:00am-12:00pm). You can also visit us on the web at www.taylorrentalocala.com.